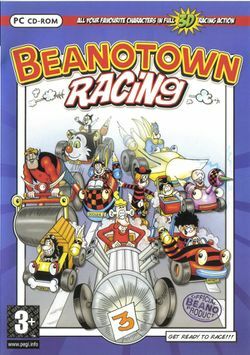 Beanotown Racing is a racing game developed by Simian Industries for ZOO Digital Publishing and released for the Microsoft Windows operating system on November 14, 2003; it uses characters from the two D.C. Thomson and Co. comics The Dandy, which was published from 1937 to 2012, and The Beano, which was first published in 1938. The player may initially select either Korky the Cat, Dennis the Menace, Roger the Dodger, Minnie the Minx or Bea the Mini-Menace (Dennis's younger sister) to drive a car in the Beanotown Championship, but two other characters (Walter the Softy and Calamity James) can be activated by entering cheat codes (that were given in the comics at the time the game was new) on the game's Main Menu - and five more characters (Desperate Dan, Plug from The Bash Street Kids, Gnasher, Bananaman, and Brain Duane) have to get unlocked by winning specific races with specific characters (for Dan's case, the player must win a Championship with any of the others). The Beanotown Championship is comprised of six tracks: Wild in the Country (which takes place in the Beanotown Country Park), The Bash Street Burn Up (which takes place at Bash Street School), Street Streak (which takes place on the streets of Beanotown), The Dandy Dash (which takes place at the Dandy Embassy), Haunted Castle (which takes place at Bunkerton Castle, originally inhabited by Lord Snooty and later a retirement home for former Dandy and Beano characters) and Wild West Test (which takes place in Desperate Dan's home town of Cactusville); for this game's "Single Race" and "Time Trial" modes, the third, fourth, fifth, and sixth tracks have to get unlocked by finishing first, second or third on them in the "Beanotown Championship" mode, even though the other two modes are just for practice and seeing how fast a player can complete a lap of a specific track respectively.